Apricot Drift Roses add a fresh look to your garden as a true flowering ground cover rose. The Apricot Drift Rose is a double flowering apricot drift that begins flowering in the spring and blooms continually all the way to frost. It grows only to a height of 1 to 2 feet with a spread 2 to 3 feet. 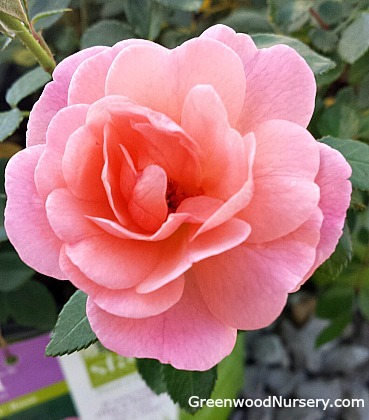 It is a tough and disease resistant rose bush you’re sure to enjoy for years to come. From the people who introduced The Knock Out® Roses, a new rose carpet like ground cover rose. Like The Knock Out® Roses, Apricot Drift® Roses are repeat bloomers that are tough, disease resistant, winter hardy and virtually maintenance-free. Drift® Roses, or commonly called carpet roses or ground cover roses, are a cross between full growing roses and miniature roses. From Knockouts, they kept toughness, disease resistance and winter hardiness. From miniatures, they have inherited their well-managed size and repeat-blooming nature. Continuously blooming from spring to frost, they are naturally dwarf, with very attractive foliage. Winter hardy to zone 5. The low, spreading habit of Drift® Roses makes them perfect as small garden plants, hillsides, perennial beds and even awkward areas. They brighten up borders, fill in empty spaces, and spread delicately around your favorite established plants. Apricot Drift Rose ships in Trade size ONE-GALLON containers.